Don’t worry, there hasn’t been a takeover or anything. It’s still just me in the roles of designer, maker, accountant and tea lady, working at home here in Dingle, with some tech help from my partner and some lovable hindrance from the cats. I thought it was time for a new look and I’m delighted with this design and style, evoking the colours of sea and sky, and the sea-pink flowers that grow all around the shore. Puffin Patchwork has been my business name since 2001 when we were adopted by our beloved black and white cat, Puffin. The Puffin element definitely had to remain for many reasons, but the Patchwork element of the name has become outdated as my designs have evolved. Puffin’s name has been joined by that of her daughter Tilly who is curled up next to me as I write. An exciting parcel arrived from the printers with new packaging materials for gift wrapping your purchases. 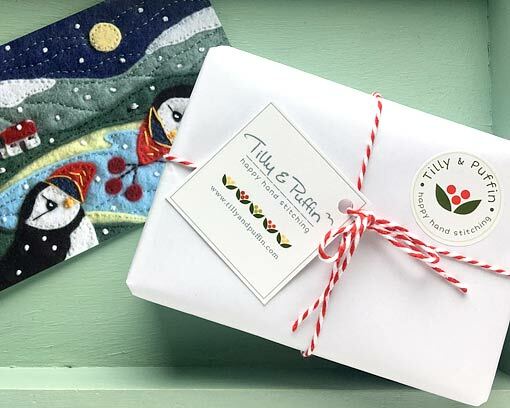 The shop continues to run on Shopify with its excellent payment and security features and is now part of the new improved website at tillyandpuffin.com. The shop has had a spruce-up but still stocks all the favourites along with some new products, and the range of kits and sewing patterns is growing steadily, with lots planned for the new year! Enjoy your creations! Beautiful work!